A subscription payment page allows your customers to subscribe to a recurring payment that will be automatically deducted from their cards every billing cycle (yearly, monthly, daily or even hourly). 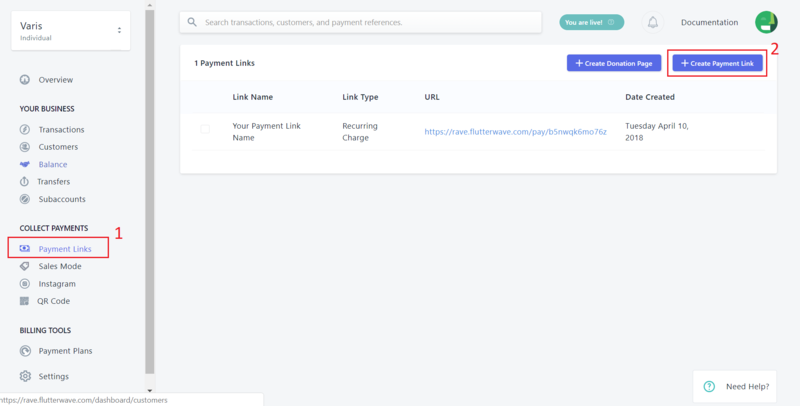 Your customers can access your different subscription payment pages through links that Rave will generate for you. From the dashboard, go to the “Payment links” page and select “Create Payment Link”. In the dialog box that shows up, select "Recurring Charge". Fill in the details for the subscription including the intervals between payments (hourly, daily, monthly or yearly) and the number of times the customer is to be charged after the first payment. Select “Create Link” to create the link to your subscription payment page. 5. You can share this link with your customers for them to access your payment page and subscribe to the payment plan.